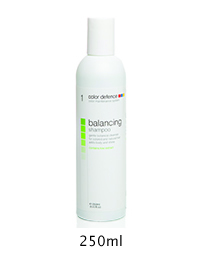 Balancing shampoo: low pH shampoo for coloured hair; cleanses and prepares the hair to take up tone evenly by creating a uniform negative electrical charge from roots to ends. Balancing conditioner: lightweight botanical conditioner for coloured and natural hair; provides instant detangling, enhances body manageability and shine, restores the pH balance of hair and evens out porosity. Hydrating mask: weightless botanical hydrating treatment for coloured and natural hair, enhances manageability and shine and locks in colour while replenishing vital moisture to dry and damaged hair. Can be used daily if required. The 9 Color Defence shades can be mixed for the required salon service or to match the client's personalised colour for home maintenance. Color Defence offers 7 in-salon services. Color Defence seals in salon colour by adding pigment into the cuticle trapping the permanent/demi-permanent pigment in the cortex of the hair, helping to stabilise the fresh colour. Color Defence enhances the end result of any salon service: hair cut, styling and blow-dry. Color Defence acts as a gentle non-chemical toner, creating and maintaining the tone of highlights and special effects without changing the natural hair colour.It gives the colourist total control and flexibility of the tonal result. Using Color Defence to colour match mid-lengths and ends during retouch services create an even base on which to apply your chosen colour, giving a consistent colour result from roots to ends. Hair is less stressed with improved condition due to the reduced amount of time that permanent colour is processed on the midlengths and ends. Color Defence allows you to create a perfectly even base by establishing correct undertones to support your target shade, giving you total control over your colour result and protecting the hair condition by eliminating chemical fillers.The finished colour result will be more even and natural with realistic pigmented undertone and greater colour stability. Color Defence offers a quick and simple method of re-establishing lost tone due to re-texturising services, eliminating unwanted base tones which occur when colour is applied over the porous hollow ends of chemically re-texturised hair. Color Defence can be used for colour corrections to neutralise unwanted hair colour tones such as 'chlorine green' and 'bore well water' discolouration, eliminating the need for chemical correction. Color Defence offers a prescriptive take-home system to maintain the vibrancy, shine and condition between salon colour applications. Using the Color Defence mixing guide, the colour technician fills either a 125ml or 200ml prescription bottle with a blend of Color Defence shampoo or conditioner to match the client's salon colour. 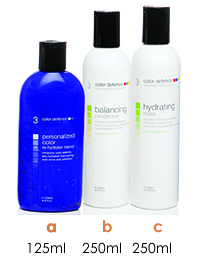 The prescription is then recorded onto the client's colour chart for future reference, along with the recommended moisturising option a, b or c.
Color Defence is a prescriptive colour maintenance system for coloured hair comprising of a range of non-ammonia temporary toning shampoos and re-hydrators in 9 shades. Not only can it be used as an integral part of the salon's Colour Services but also as a Home Maintenance System to maintain the vibrancy, shine and condition between permanent dye applications. 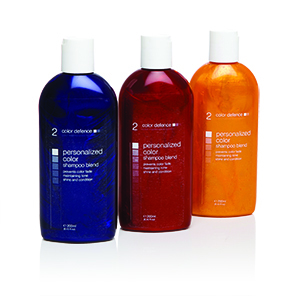 It is designed to enable the colourist to easily mix a shampoo and re-hydrator to match the client’s salon colour. Permanent colour will fade and become dull over time due to UV light, heat from straighteners, harsh shampoos and chlorine in swimming pools. The use of the Color Defence Colour Shampoo followed by the corresponding Color Defence moisturising option will guarantee an optimal colour and care result refreshing the permanent colour. 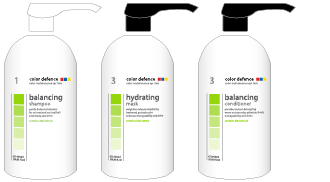 The Color Defence Colour Shampoo is a gentle cleansing colour depositing shampoo, which can be used either on its own or after a low pH cleansing shampoo. It contains a UV filter to protect the dyes and the hair from UV-induced fading. The Color Defence Colour Re-hydrator is a non-greasy colour depositing conditioner used to close and smooth the hair cuticle, improving the adhesion of the dyes by locking them in. It contains a mix of active ingredients including wheat protein and ceramides leaving your hair feeling soft and shiny. The Color Defence System is not intended to replace a permanent or semi-permanent dye – it is meant to intensify, correct or harmonise an existing colour. Both the shampoos and re-hydrators are highly charged with temporary dyes and ultra-shiny particles of pearlized mica which are deposited only on the surface of the hair shaft, and with regular use will intensify the colour obtained. If application is discontinued, the colour will gradually fade and wash out with no unsightly re-growth at the roots. 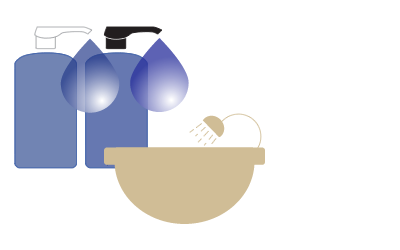 Neither the shampoo nor the re-hydrator contain ammonia, oxidizing agents, sulphates or alcohol and both are compatible with all hair dyes. Color Defence offers 7 in-salon colour services – see Manual for detailed instruction.